To ensure its financial inclusion drive is not restricted to meeting branch opening targets, the Union finance ministry is to ask banks for a performance report of the 'ultra small' branches set up in the past two years in about 73,000 villages. The performance would be examined on opening of new accounts, deposits and advances, as well as recovery of loans. "We will ask banks to give a report on how these branches have performed as on March 31, 2012. 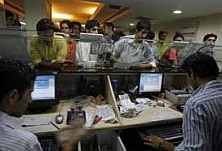 Banks will have to provide details with regard to various parameters," said a ministry official. Customers at such branches are supposed to be serviced by banking correspondents (BCs), doing cash transactions where the population lives. The model has not picked up as hoped. A parliamentary standing committee had criticised the government for not taking any action on its recommendation of conducting a study on the model's effectiveness. services not provided by BCs. In 2006, banks were first allowed to adopt the BC model for delivery of services in unbanked and under-banked areas. Retired bank employees, retired teachers, retired government employees, former soldiers, individual owners of kirana/medical/fair price shops, individual public telephone operators, and agents of small savings schemes of government and insurance companies were permitted to act as BCs. The guidelines were reviewed by the Reserve Bank in September 2010 and banks were also allowed to engage companies registered under the Indian Companies Act, 1956, with large and widespread retail outlets, excluding non-banking financial companies, as BCs. Banks were asked in 2010-11 to provide appropriate banking facilities to habitations with a population in excess of 2,000 by March 2012. In Budget 2012-13, finance minister Pranab Mukherjee proposed to extend the campaign to habitations with a population of at least 1,000 in northeastern and hilly states. About 12,000-15,000 more villages are likely to be covered in the next round of financial inclusion.